Mitsubishi Electric has introduced a portable HMI pendant to work across multiple machines to improve operator effectiveness. The pendant terminal forms part of the GOT2000 series operator panels. Named the GT2506HS-VTBD handy model, it provides a 6,5” TFT LCD display with 65K colours, VGA resolution and up to 80MB internal memory. Moreover, it comes with Ethernet, USB host & device, RS-232, RS-422/485 and an SD card slot. The lightweight and compact design supports single hand operation, with a single back strap to prevent dropping the terminal. The new design allows its use at a natural wrist angle to reduces operator fatigue, and means screen is easily seen from the front. The rounded and easy-to-hold grip is held with the left hand and operated by right hand). Since the GT25 Handy GOT is removable, users can connect it only when needed. This saves installation space for the control panel and operation panels. Furthermore, the standard 10m cable length supports operating the GT25 Handy GOT standing near the device. This can also be useful for machine setup, adjustment, and changeover of the device. With the connector conversion box, can work across multiple machines. Achieving this is by switching devices to operate according to the ID number of the connector conversion box. This function is useful when performing maintenance on several processes in a single system. 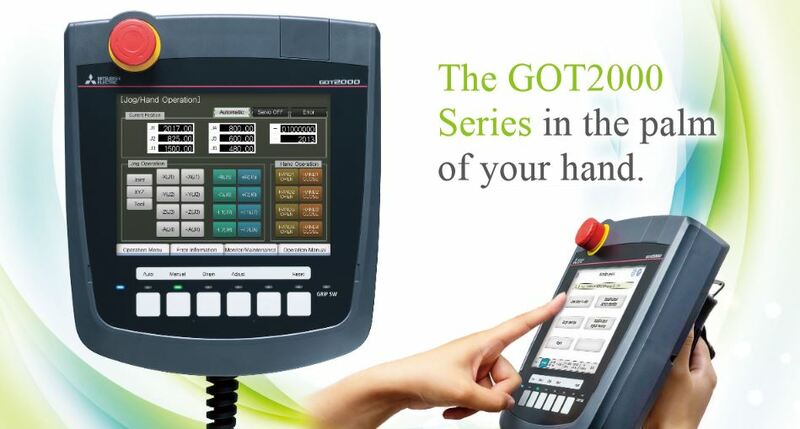 The GT25 Handy GOT connects to the programmable controller which has the IP address set to the acquired ID. If replacing an existing installation of GT14 Handy GOT with the new model. All existing cables and connector conversion boxes are usable. Furthermore, the switch positions and appearance are like the earlier model. Many of the functions of the GT2506SH will also be familiar to existing users. Design of the operation screen uses HMI/GOT Screen Design Software GT Works3, together with various customisable sample screens are available. The emergency stop switch uses a normally closed contact for safely stop the operation. A stop switch guard cover option is also available to prevent accidental operation. Six push button switches with green LEDs confirm the operation of an externally connected device. Their use also includes operating and stopping machines. Button names can be freely changed using a name sheet. The terminal has a built-in 32 MB memory. Installing an SD card provides extra storage of data such as document display data, logging data, and backup data. Fitting of the three-position (OFF-ON-OFF) switch prevents accidental operation, or to prohibit operation. The GOT connects to an external device as a dead man’s switch, with commands sent to a machine to stop operation immediately. The two position keylock switch restricts operations according to the position. Additionally, removing the key disables the device for all operations.